Accessory nerve is one of the most sensitive cranial nerves to injury, and its injuries are usually caused by iatrogenic interventions. As many other causes can mimic its clinical presentation, careful physical examination should be performed while evaluating a patient suspected of accessory neuropathy. In this report, we aimed to illustrate a very rare case with concurrent traumatic cranial neuropathies of accessory nerve, suprascapular nerve, and long thoracicus. A 16-year-old boy was admitted with complaints of shoulder weakness and pain following a trauma of strain injury. He had first taken the misdiagnosis of brachial plexopathy; however, after a detailed physical examination and electrophysiological study, the diagnosis of concurrent traumatic neuropathies of accessory, suprascapular, and long thoracicus nerves was made. In our opinion, during evaluation of these rare traumatic neuropathies, detailed clinical evaluations combined with detailed electromyography investigations may give crucial data for the proper diagnosis. Accessory nerve is a cranial nerve that controls the sternocleidomastoid (Scm) and trapezius muscles, and traditionally, it is described as composing of two parts: a spinal and cranial part. However, modern descriptions suggest the cranial component as a part of vagus nerve, referring to the accessory nerve as the spinal accessory nerve (SAN). The spinal accessory nerve is reported to be one of the most sensitive cranial nerves to injury, and its injuries are usually caused due to iatrogenic interventions. It has also been reported to occur following blunt trauma and strain injuries. On the other hand, suprascapular nerve neuropathy is a rare cause of shoulder weakness, which is mostly reported to occur due to compression from ganglion cyst and injuries related to sport activities. Besides, long thoracic nerve which supplies the serratus anterior has been reported to be sensitive to injury. In these clinical suspicions, electrodiagnostic nerve examinations may be required for the final diagnosis and also for the determination of the improvements in the follow-up. In this report, we illustrate a very rare patient diagnosed with concurrent traumatic injury of SAN, long thoracicus nerve, and suprascapular nerve which had developed after a traumatic strain injury. Via this case, detailed clinical and electrophysiological findings of this rare entity will be demonstrated. A 16-year-old boy was referred to our electromyography (EMG) center with complaints of right shoulder-arm weakness and burning type of pain in the right shoulder. It was learnt that shoulder and arm weakness had started abruptly soon after a strain sport injury 1 month ago (soon after he threw the ball up with his right shoulder during a basketball match). One week later, scapular burning-like pain had started gradually. Neurological examination (on the 1st month of injury) revealed reduced power in the right shoulder abduction (Medical Research Council (MRC) grade 4/5) and anteversion (MRC 4/5), but sensorial examinations were found to be normal. Routine nerve conduction studies (NCSs) of the right upper extremity (median motor/sensorial and ulnar motor/sensorial) revealed normal findings. EMG study on the 4th week of the trauma showed subacute denervation in the right infraspinatus, supraspinatus, deltoid muscles, and more prominently in the right trapezius muscle. As a result, first diagnosis of upper brachial plexus injury was made. However, denervation effects in the trapezius muscle were evaluated as atypical and a 2nd EMG study was planned in the follow-up visit. In the interval period, transcutaneous electrical nerve stimulation therapy was administered for 3 weeks by a physical therapist. He described improvement in sensory symptoms during the 1st week and recovery in shoulder weakness during the 2nd week of treatment. Two months after 1st EMG, the patient's sensorial symptoms were recovered and right upper-extremity motor power was moderately improved. On concurrently performed 2nd EMG (2 months after 1st EMG), right upper-extremity NCSs (median, ulnar, radial nerves motor, and sensorial conductions) were found to be in normal ranges. Needle EMG investigations showed subacute–chronic denervation in the right supraspinatus, infraspinatus, Scm, serratus anterior, and trapezius muscles [Table 1]. These results could not fully be explained with any type of brachial plexopathy injury. Hence, the patient was re-evaluated. Remarkably, on palpation, a narrow area in the inferior localization of occipital neck triangle was found to be painful. That was a transit point (in the superficial area) for the three nerves of SAN, long thoracic nerve, and suprascapular nerve, the injuries of which could explain the abnormal EMG findings and clinical picture of the patient. Accessory NCS from right trapezius muscle revealed conduction block at stimulation from middle Scm, but normal compound muscle action potential (CMAP) from stimulation at Erb point [Figure 1]a. Long thoracicus NCS obtained by serratus anterior muscle record again revealed conduction block from Scm stimulation [Figure 1]b. Suprascapular NCS was not available, because the patient was unable to tolerate the procedure. In conclusion, these results were addressing the concurrent traumatic injuries of right SAN, long thoracicus nerve, and suprascapular nerve in the localization between middle Scm and Erb point. Contrast-enhanced cervical magnetic resonance imaging results were unremarkable, excluding a possible cause of mass lesion. Consequently, after the diagnosis, he was referred to a physical therapist follow-up. The spinal accessory nerve is derivated from the ventral rami of C5, C6 roots. It enters the skull through the foramen magnum. SAN courses along the inner wall of the skull toward the jugular foramen, and exits the skull together with the glossopharyngeal (CN IX) and vagus nerves (CN X). The SAN branches off passing deep into the posterior belly of the digastric muscle to supply the Scm. It transverses the posterior triangle of the neck, superficial to the prevertebral fascia, where its superficial location makes the nerve extremely susceptible to injury., Most common reported causes of SAN injury are radical modified neck dissections, excisional biopsy of tumors or enlarged lymph nodes, hemithyroidectomy, and surgery of carotid and cardiac interventions. Rarely, it has been reported to occur due to blunt trauma or stretch injury., EMG investigations may provide crucial informations for the proper diagnosis. Kierner et al. argued about improper CMAP responses during SAN NCSs those occurred short distal latenced due to direct stimulation of the muscle and offered to perform NCSs of the asymptomatic side for comparison. Accordingly, we performed NCS also for the asymptomatic side which revealed normal CMAP responses for the two stimulation points (Scm, Erb). Nonetheless, symptomatic side stimulation at Erb point evoked normal CMAP, whereas Scm stimulation did not generate any response. Needle EMG study clarified the axonal damage in the area of SAN innervation. Hence, a massive axonal damage of the right SAN between the segment connecting Scm and Erb points was demonstrated. On the other hand, very interestingly, concurrent traumatic neuropathies of suprascapular nerve and long thoracic nerve in the similar localization were also determined following further examinations. Besides, suprascapular nerve neuropathy constitutes rather an infrequent cause of shoulder weakness, and most commonly occurs as a result of compression injuries at suprascapular or spinoglenoid notches usually due to the occupying ganglion cysts. Other reported factors include trauma of the nerve, compression of an underlying neurinoma or vascular malformations, and usually damage occurring during sport activities as in our case. Long thoracic nerve derivates from the anterior rami of the fifth, sixth, and seventh cervical roots. It descends behind the brachial plexus and the axillary vessels, resting on the outer surface of the serratus anterior. On the posterior triangle of neck, it travels anteriorly to the scalenus posterior muscle and traverses distally and laterally, going below the clavicula. Due to its long and superficial course, it has been reported to be vulnerable to damage at different levels. Various causes including tumor surgery, autoimmune disease, and traumas during sport activities are reported as causative factors. It has been explained that during activities such as raising your arm overhead and concurrently rotating head away from affected extremity, the nerve may double between the points of relative fixation and become stretched, resulting in neurapraxia., While symptoms are usually reported to be minimal, symptomatic patients may suffer from a posterior or scapular burning type of pain, and a more specific finding is “winged scapula” occurring as a result of serratus anterior muscle paralysis. Our case demonstrated both sensorial and motor symptoms of long thoracicus neuropathy. In addition, interrogation of the history revealed a similar trauma position defined in the literature which has occurred during the maneuver of throwing ball in the basketball match. After branching from the anterior rami of cervical roots or upper trunk of brachial plexus, all the three nerves pass across the posterior triangle of the neck, where at an area behind the posterior scalene muscle they approach each other at a minimum distance. On palpitation, this area was found to be painful. We think that anatomical features in our case such as scalene muscle hypertrophia or long neck length, which could have formed an unstable anatomical area for all the three nerves, might probably have been efficient in these rare manifestations. On the basis of such an unstable ground, muscle hypertrophia possibly might have formed an abnormal increased mechanical compression on these nerves which was triggered by stretch trauma during the sport activity. However, more importantly, we point out the necessity of combined clinical and detailed EMG investigations for evaluation of these patients admitting with shoulder or upper-extremity weakness. In the 1st EMG study, denervation effects in the trapezius muscle were evaluated to be atypical of brachial plexopathy. However, aberrant innervations of trapezius as reported in the literature were held to be responsible, and the 1st EMG study was evaluated to be in accordance with upper-trunk brachial plexopathy. Nonetheless, in the 2nd EMG study, he was reevaluated and atypical clinical findings involving “wing scapula,” trapezius atrophy, and difficulty particularly at wide angle abduction aroused suspicion on the diagnosis of brachial plexopathy. At this point, NSCs as well as needle EMG studies gave critical information in the final diagnostic process. To our knowledge, this is the first illustration of a patient with concurrent traumatic SAN, suprascapular nerve, and long thoracic nerve neuropathies. 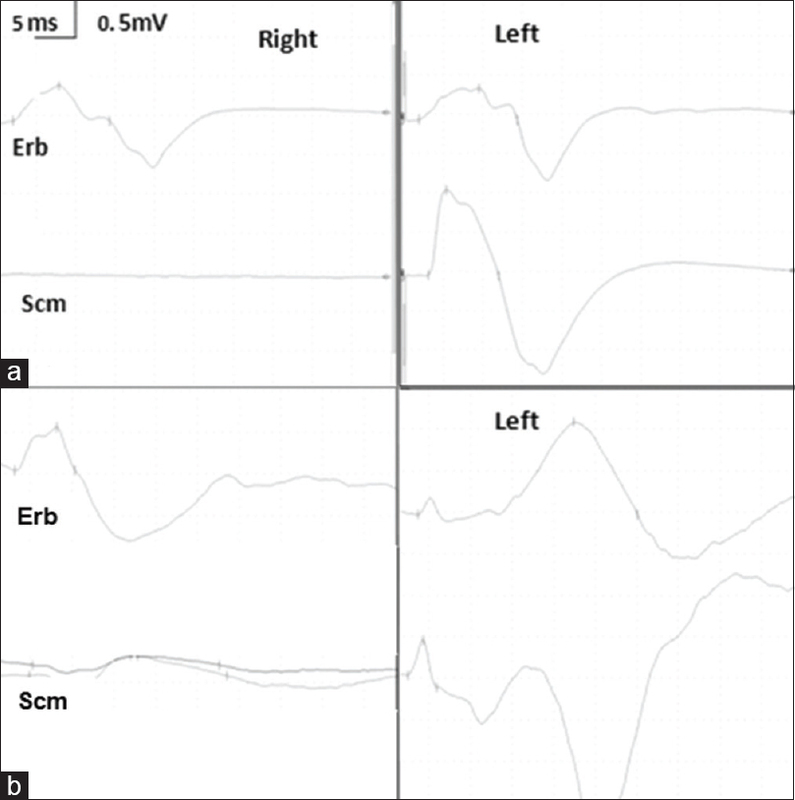 Besides, this case illustrates a detailed clinical and EMG results which were complementary with each other highlighting the importance of detailed EMG investigations and clinical evaluation in the proper diagnosis of these rare entities. In cases presenting with shoulder weakness and showing atypical feature, a very detailed clinical evaluation constitute a vital stage. In light of the deliberate clinical evaluations of these features, further electrophysiological studies may give substantial contributions for the final diagnosis. Standring S. Gray's Anatomy: The Anatomical Basis of Clinical Practice. 41th edition of Gray's Anatomy: 2015. “Spinal accessory nerve”. Structure of the human body. Loyala University Medical Education Network. ARchived from the original 2007. Mariani PP, Santoriello P, Maresca G. Spontaneous accessory nerve palsy. J Shoulder Elbow Surg 1998;7:545-6. Donner TR, Kline DG. Extracranial spinal accessory nerve injury. Neurosurgery 1993;32:907-10. Fankhauser F, Schippinger G. Suprascapular nerve entrapment by a ganglion cyst: An alternative method of treatment. Orthopedics 2002;25:87-8. Salazar JD, Doty JR, Tseng EE, Marin PC, Girotto JA, Roseborough GS, et al. Relationship of the long thoracic nerve to the scapular tip: An aid to prevention of proximal nerve injury. J Thorac Cardiovasc Surg 1998;116:960-4. Wiater JM, Bigliani LU. Spinal accessory nerve injury. Clin Orthop Relat Res 1999;368:5-16. Bodack MP, Tunkel RS, Marini SG, Nagler W. Spinal accessory nerve palsy as a cause of pain after whiplash injury: Case report. J Pain Symptom Manage 1998;15:321-8. Sweeney PJ, Wilbourn AJ. Spinal aSccessory (11th) nerve palsy following carotid endarterectomy. Neurology 1992;42:674-5. Braybrooke J, Kumar C, Morris E. Spinal accessory nerve palsy following blunt trauma. Injury 2003;34:948-9. Kierner AC, Burian M, Bentzien S, Gstoettner W. Intraoperative electromyography for identification of the trapezius muscle innervation: Clinical proof of a new anatomical concept. Laryngoscope 2002;112:1853-6. Avery BW, Pilon FM, Barclay JK. Anterior coracoscapular ligament and suprascapular nerve entrapment. Clin Anat 2002;15:383-6. Safran MR. Nerve injury about the shoulder in athletes, part 2: Long thoracic nerve, spinal accessory nerve, burners/stingers, thoracic outlet syndrome. Am J Sports Med 2004;32:1063-76.